Maintaining the appearance of fresh, glowing, beautiful skin requires that you take notice of your skin’s health on a regular basis. Are you doing what is necessary to keep your skin healthy? Do you wear sunscreen every day? How often do you cleanse your skin? Does your skincare routine include applying a Vitamin C or retinol product? Time will reveal how well or how poorly we’ve treated our skin. However, with light and laser treatments, our potential for beautiful, healthy skin is almost always within reach. At Artisan 57, we strive to use the most advanced modalities to fight the signs of aging skin – wrinkles, skin laxity, poor skin tone and texture, pigmentation and vascularization. Do you want the shortest route to reveal healthier skin? Light-based and laser resurfacing treatments may be for you! Why do we get so excited about the impact these devices have on the health of your skin? Because not only is there an “outward” change in your skin, these devices also excite the skin at a cellular level to produce the most coveted tissue within our skin – Collagen. First of all, let's discuss the power of light. Our Broadband Light Treatment (BBL) employs different wavelengths of filtered light to rejuvenate the superficial surface of your skin, with the benefit of stimulating the regeneration of collagen in the deeper skin layer, the dermis. BBL is a go-to treatment for our clients wanting to diminish the appearance of sun damage, freckles, broken capillaries, rosacea or any other unwanted red and brown pigments. Now come the lasers! We have three unique methods that can be used alone or in combination to help you achieve the desired effect for your skin. To begin with, our MicroLaserPeel (MPL) is also known as superficial skin resurfacing. Think of a MicroLaserPeel as “mowing” the lawn. The laser travels over the entire surface of your skin, and precisely removes the very top layer of your skin, much like a lawn mower does to the grass. Once the skin heals, one notices an improvement such as smooth, glowing, less pigmented skin. It also has the side benefit of stimulating collagen. This procedure can have a longer and more intense healing time than our light treatment, but the results of this procedure for our clients can also be more dramatic. The next laser method widely used is Fractional Resurfacing. Think of this as “aerating” the lawn – or skin. The laser travels over the entire surface of the skin, but only affects a fraction of the total skin surface – much like aerating your lawn. This also allows us to go deeper into the skin (aka lawn) to directly stimulate the collagen in the dermal layer – all without really long healing times. This treatment is great for any skin concerns, but truly shines for fighting fine and deep wrinkles, heavy sun damage, and scars. The last (but not least!) laser to discuss is also our newest – and the one we see as bridging the gap between great treatment results and minimizing downtime – the HALO. 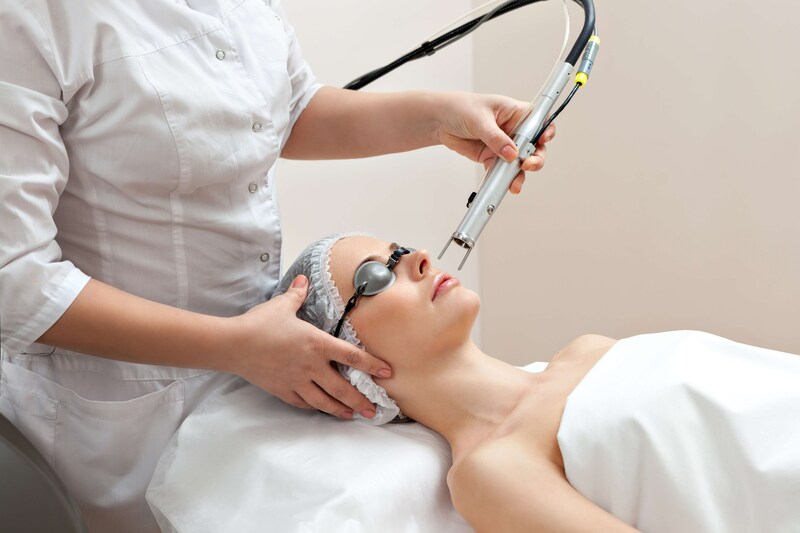 The HALO is a Hybrid Fractional Laser with 2 lasers that get used simultaneously to regenerate collagen and also remove some of the top surface cells from your skin. This leaves you with glowing skin and a BIG impact on collagen regrowth. This laser is for those who want amazing results for fine lines, and wrinkles, improvement of pore size, and minimizing pigmentation and sun damage, but don't necessarily want to cloister themselves in their homes for 2-3 days while they heal. If you’re curious about learning more about these or other treatments available at Artisan 57, please contact our office to schedule a complimentary skin evaluation. Your first skin evaluation with us is always complimentary, and it’s a great opportunity to learn about the health of your skin and how small changes in your routine can have incredible impacts in the appearance of your skin.